Home > how to measure? Here is the full guidance for you to complete the measuring steps if you want to order a tailor-made dress. Follow each step and remember that only correct measurements ensure the perfect fitness. &nbsp;The person who is measured should keep in an upright, natural standing position without &nbsp;unnecessary actions. &nbsp;When the girth around parts of your body is taken, make sure that the measuring tape is held &nbsp;horizontally, not too loose nor too tight. &nbsp;After measuring, go to&nbsp;checklist&nbsp;to see standard figures. &nbsp;We will add some margin when we make the clothes. We will help you to decide the length of the gown for you if you only provide your height. But we can make the dresses more suitable if you could follow this step and provide the length of the gown. The length of the gown is the distance from neck point across the breast point to the lower hem of the gown,the end of the gown or any other point you want to end the dress. Take one of your dresses and try to measure its length. Measure the distance of your target length. If you still can not make sure, mark some notes such as “I’m not sure about the clothes length I offer” in your order sheet! If you cannot determine the length, inform in the order sheet that you want an ankle-length, knee-length or whatever length dress.This may help our tailor to determine for you. Usually the length of an ankle-length dress is 25cm/11inches shorter than your height.For example, for a lady of 165cm/65inches, her ankle-length dress should be 140cm/54inches. Make sure that you measure between the shoulder joints or you’ll have wider or narrower shoulders width. If you order a sleeveless dress, do not waste your time on this figure.It is not needed! Congratulations! 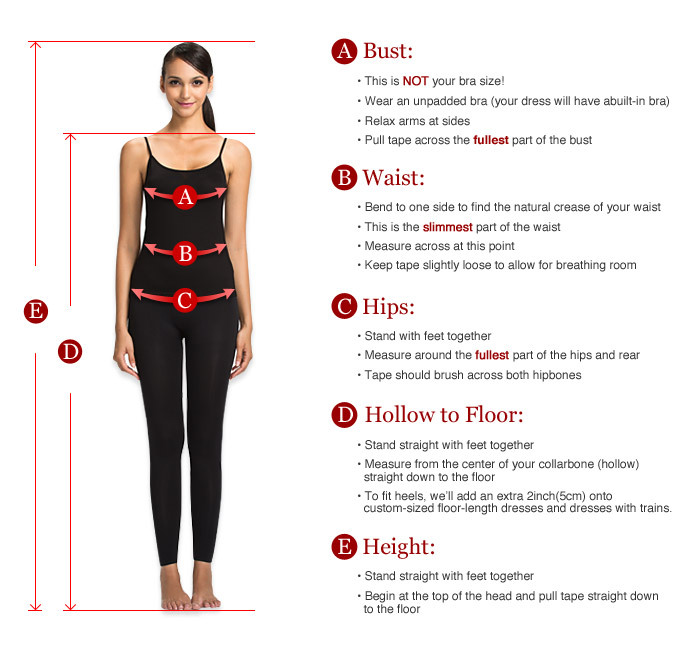 Now you’ve measured all the most necessary figures for a fitting dress!If you are a perfection chaser, click to the next page and continue with some advanced measuring! If you order a sleeveless dress, do not waste your time on these figures. If you order a short sleeve dress, do not offer wrist girth. -Your fat is mostly stored on that part! -You have strong thighs that the thigh girth is actually the larger than your hip girth!